He does strike a nerve there. Ever since Gugod's amazing perlbrew came to life, installing your custom perl - or several perls for that matter - is *really* easy. However, a new problem surfaced: updating your installation so your applications work again. This is, of course, per design. After all, perlbrew is supposed to give you completely separate installations, and this includes installed modules. So, what can you do? Copying your lib directory is out of the question if you have any module that does XS, and chances are you probably do. I'm also not sure if an external local::lib directory would play nice either. What I did there was use the core module ExtUtils::Installed to create a list of installed modules in the file "/tmp/installed.list", then feed that list to cpanm. I used "--interactive" because some modules I have (like SDL) ask a few questions during installation, but whatever rocks your boat. I think this tip is particularly pertinent if you're trying out a Release Candidate (RC) for a future perl release and want to make sure your toolchain builds properly - which is always a good idea. Hope it helps! Happy Perl Brewing! Didn't Miyagawa also write carton, perl's answer to ruby's Bundler gem? Yay! Now put in inside perlbrew so it can be done in one step. 'perlbrew save-installed-modules' does 'step 2' of the list, and 'perlbrew install-saved-modules' to do 'step 5' of the list... at least, that'd be the way I'd implement it. I'll have to send this to myself at home and see if I can write a patch still. This is a place where I can write about Perl stuff. 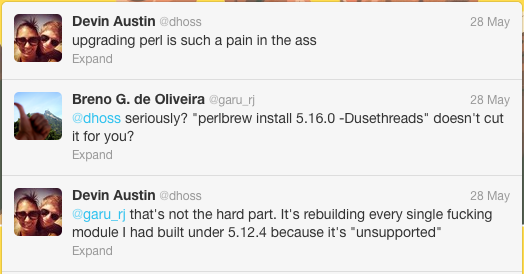 More importantly, about Perl modules, and all the things that makes this such an amazing programming language.